CIVIC is a Washington-based non-profit organization that believes the civilians injured and the families of those killed should be recognized and helped by the warring parties involved. On this blog, you will find stories from our travels around the world as we meet with civilians and military, aid organizations and government in our quest to get war victims the help they need. Trevor Keck is CIVIC’s field fellow, based in Kabul, Afghanistan. He is assessing Afghan National Security Force preparedness to protect civilians after NATO and its allies withdraw. “Transition” is the word on the tip of everyone’s lips in Afghanistan these days—a catchphrase I’ve heard employed more than any other since arriving in Kabul about two weeks ago. Why “Transition?” Because in less than three years time, Afghan National Security Forces (ANSF) are expected to assume responsibility for securing the country and protecting the population. To prepare for the security transition, US and international military forces have concentrated their efforts on securing southern Afghanistan—the so-called “heartland” of the insurgency—whilst intensifying efforts to train and equip the ANSF. The message from the International Security Assistance Force (ISAF)—the U.S. led security force in Afghanistan—is that security is improving as a result of these efforts. Last spring, a Pentagon report concluded that President Obama’s strategy had produced “tangible progress” in Afghanistan. More recently, David Rodriguez, former Commander of ISAF Joint Command, wrote “there are indisputable gains everywhere we have focused our efforts.” Talk of progress and security gains has been pervasive in my early Kabul meetings. But that message stands in stark contrast to what I’m hearing from international and humanitarian organizations. In its mid-year report released in July 2011, the U.N. political mission in Afghanistan reported that “civilians experienced a downward spiral of protection” during the first half of 2011 with civilian casualties higher than at any other time since 2001. Indeed, nearly 1,500 civilians were killed during the first half of 2011, an increase of 15% from the same period during 2010. More recently, the U.N. confirmed significant civilian casualties last month largely due to the twin suicide attacks in Kabul and Mazar al Sharif. To be clear, the Taliban and other armed groups are responsible for the majority of civilian casualties in Afghanistan – roughly 80%, according to the U.N. Despite pledges to avoid killing civilians, armed groups have continued to resort to indiscriminate tactics, including improvised explosive devices and suicide attacks, which combined are responsible for nearly 50% of civilian casualties in Afghanistan, according to the U.N. For the past two years, armed groups have also increasingly resorted to assassinations, targeting public officials and others who cooperate with ISAF and the Afghan government. Meanwhile, as civilian casualties caused by armed groups have spiked over the past few years, the number of civilians killed or injured by international military forces has gradually declined, largely due to the policies ISAF has put in place to mitigate civilian harm. That being said, Afghans want and expect ISAF and the ANSF to improve efforts to protect them from all acts of violence, regardless of which warring party is ultimately responsible. Afghans I have met since arriving are very worried about the future. One former government official I spoke with voiced his concern that Afghanistan could slide back into civil war after the bulk of international military forces depart at the end of 2014. Like many others in the country, he isn’t confident that the ANSF will be able to provide security on their own, and he’s concerned about the proliferation of weapons and armed groups. Why such disparate narratives and assessments of the security situation? One reason could be that ISAF is using different metrics than international and nongovernmental organizations. Counterinsurgent forces tend to examine territory held and the quantity of indigenous security forces trained and equipped to measure progress. And as noted, ISAF has taken very concrete steps to mitigate civilian harm, resulting in fewer civilians killed or injured by international military forces. Meanwhile, the U.N. and nongovernmental organizations are analyzing overall levels of violence and civilian casualties – which have increased over the past several years. Another reason may be that ISAF is setting a tone for its departure. With the U.S. elections less than a year away, the Obama Administration would like to reassure a war weary public that it has turned the Afghan war around. While not ill – intentioned, the U.S. and its allies may simply be focused on highlighting what they have achieved, including reduced levels of civilian casualties caused by international military forces as well as reinvigorated efforts to improve the “quality” of Afghan security forces. But the problem still remains – while ISAF has improved its own civilian casualty statistics, the number of civilians harmed or killed in Afghanistan is increasing. Indeed, if “security gains” are to be measured by fewer civilian casualties, then security is deteriorating in Afghanistan. As international military forces prepare for withdrawal, they should be clear-eyed about the toll the war is taking on civilians and what needs to be done to better protect ordinary Afghans. Over the next six months, I will be taking this message to ISAF on behalf of CIVIC. More specifically, I will be assessing the efficacy of the mechanisms ISAF has put in place to mitigate civilian harm as well as urging the Afghan government to take concrete steps to better protect civilians. I hope we’ll soon be able to agree that security is improving in Afghanistan. Mention “war” or “armed conflict,” and many people scroll through mental images of soldiers engaged in combat or of pock-marked villages halfway across the world. But these images are just a fraction of that element. War’s impact doesn’t end when the bullets and bombs stop. Its effects stretch beyond the fighting and encompass civilian death and injury, community destruction and devastatingly interrupted lives. Civilians’ basic needs are often no longer met and their capacity to meet them in the future is made nearly impossible when their livelihoods are gone. They are left with very little help from the warring parties to rebuild. For communities ravaged by war, there is a desperate need to regroup, re-form, heal and adapt to these unexpected life changes. But where do they start? Helping civilian victims positively reshape their lives is a first and very crucial step toward moving away from living a life in war. In South Central Iraq, many of these crucial steps are being taken and have begun to crack the shell of devastation. 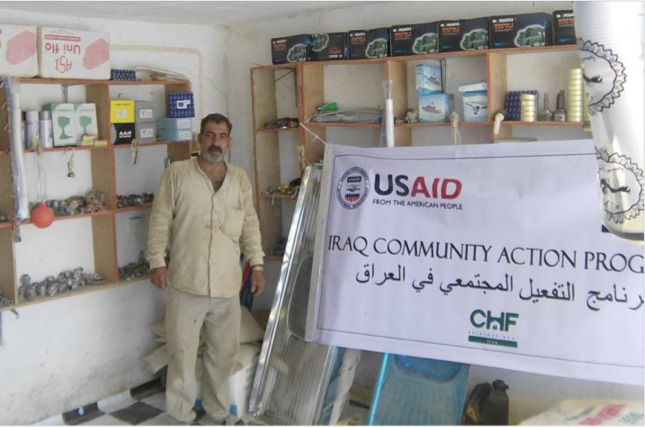 Instead of picturing the horrible aftermath of combat, picture a man in Diwaniyah, who recently opened a store with help from USAID Marla Ruzicka Iraqi War Victims Fund. Picture a group of students at a vocational school in Kerbala who previously learned about their trade through theory, but who now have new and updated machinery to help prepare them for technical careers in electrical system repair and car mechanics, among other jobs that can benefit their communities. Livelihood assistance to civilians, such as that provided by the Marla Fund, is a way for warring parties to begin the process of amending harm and placing recovery at the front of the agenda. In this case, it’s the U.S. Government that has taken the step of making amends, and is changing lives one at a time. Making amends, recognizing harm and offering to rectify in some way can help a community recover and heal in dramatic ways. When a family has the tools and hope for their future, the entire community benefits. Making amends goes beyond recognizing harm and apologizing. It creates the opportunity to rebuild lives and sets the stage for families to flourish. Around 8am on February 27, 2007, Mohammad was driving to the Pakistan Embassy in Kandahar city to collect his visa. He traveled regularly to Pakistan to buy parts for his successful car business. On the road ahead, an ISAF armored vehicle had broken down. Mohammad failed to pull over, despite requests from ISAF soldiers that he should stop his car. The ISAF soldiers responded with lethal gunfire leaving Mohammad’s mother, wife and four small children without a son, husband, father, and provider. The carpenters paid for their hospital treatment by selling their cars and furniture and by relying heavily on the assistance of family members and friends. They now have debts that make it very difficult to survive. The men finally received some assistance when ACAP approached them in January 2007. ACAP agreed to provide them with funding for their carpentry business, tailoring training for their family members, stationary for their children and additional medical treatment. Mohammad, Amanullah and Abdul have been friends for over ten years. They are carpenters who work together in Kandahar City. On June 4, 2006, they were finishing a large window frame when a suicide bomber blew himself up just outside their shop. The bomber was targeting a convoy of Canadian troops; as with most civilians caught in the conflict, the three carpenters were simply in the wrong place at the wrong time. The three friends were all injured. Pieces of shrapnel were embedded in their legs, arms and faces. Mohammad and Abdul were so badly burned that they were flown to Pakistan where they stayed for a month. “The doctors were looking at me as if I was a dead man,” Abdul told me. Over two years after the incident, the skin on his face and arms is still mottled and scarred from the burns. Zalmai was a taxi driver and the main earner for his family. His income supported ten family members, including an older brother who was shot by the Russians and is paralyzed down the right side of his body. Now the family, which includes four children under the age of three, is finding it extremely difficult to survive. They receive wheat and vegetables from relatives and depend on their neighbors’ generosity. Things began to look a little more optimistic for Ahmed when one of his relatives told him about the USAID-funded ACAP program. “Finally,” he told me, “I began to feel that there might be hope.” ACAP has agreed to buy the family a cow. “With the cow, we can manufacture milk, yogurt and we will sell this in the bazaar and get income.” As he told me this, a smile finally appeared on his face. Ahmed is still clearly grieving for his son, but now at least he can continue building a future for his family.